We have just heard back from the Croatian Ringing Scheme and they have kindly sent us the ringing details of the Lesser Whitethroat that was killed by a cat in Worcestershire previously posted. This juvenile bird was ringed at Vransko Lake in Dalmatia (below) 43'53N 15'33E on 20/09/2010. 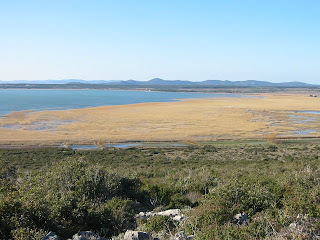 The Croatian Ringing Scheme host a ringing camp every year from August to early November and catches are usually between 25,000 to 30,000 birds per year. This is an important stopover site for passerines and waterbirds and netting largely occurs in the reeds, where the Lesser Whitethroat is not common. With only 51 Lesser Whitethroats ringed between 2001 and 2009, this recovery is even more remarkable. Thanks to Jelena Kralj of the Croatian Ringing Scheme for this information and the picture.